Recognizing the characteristics of children with learning disabilities and deciding how to help them is a problem faced by schools all over the world. Although some disorders are fairly easily recognizable (e.g., mental retardation) or very specific to single components of performance and quite rare (e.g., developmental dyscalculia), schools must consider much larger populations of children with learning difficulties who cannot always be readily classified. These children present high-level learning difficulties that affect their performance on a variety of school tasks, but the underlying problem is often their difficulty in understanding written text. In many instances, despite good intellectual abilities and a superficial ability to cope with written texts and to use language appropriately, some children do not seem to grasp the most important elements, or cannot find the pieces of information they are looking for. Sometimes these difficulties are not immediately detected by the teacher in the early school years. They may be hidden because the most obvious early indicators of reading progress in the teacher's eyes do not involve comprehension of written texts or because the first texts a child encounters are quite simple and reflect only the difficulty level of the oral messages (sentences, short stories, etc.) with which the child is already familiar. However, as years go by and texts get more complex, comprehension difficulties will become increasingly apparent and increasingly detrimental to effective school learning. In turn, studying, assimilating new information, and many other situations requiring text comprehension -- from problem solving to reasoning with linguistic contents -- could be affected. * Does a reading comprehension problem exist in schools? * How important and widespread is the problem? * Is the problem specific? * How can a reading comprehension difficulty be defined and identified? * Does the "syndrome" have a single pattern or can different subtypes be identified? * What are the main characteristics associated with a reading comprehension difficulty? * When can other well-identified problems add to our understanding of reading comprehension difficulties? * Which educational strategies are effective in preventing and treating reading comprehension difficulties? * What supplementary information can we get from an international perspective? "…provides a useful overview of issues and recent work in the field, introducing some worthwhile British and European work that may be unfamiliar to American readers. The editors have preserved the complexity of a set of challenging and important research questions." "I recommend the volume as a thought-provoking and well-informed source of knowledge about comprehension failure during reading….After reading this book, I still find reading comprehension a fascinating and somewhat obscure topic that defies even the best in the field." "The…coherence of this book is due to excellent editing, a very good introduction and the fact that the contributors are engaged in a dialogue rather than an argument….This is an important theoretical book and deserves to be in the libraries of teaching, speech and language therapy, and EP services." 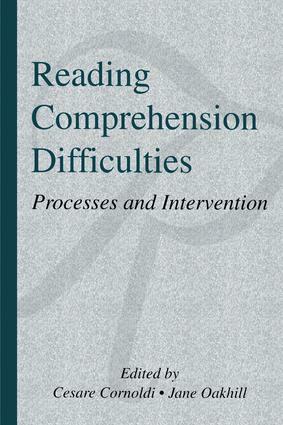 Contents: C. Cornoldi, J. Oakhill, Introduction: Reading Comprehension Difficulties. Part I: P.B. Gough, W.A. Hoover, C.L. Peterson, Some Observations on a Simple View of Reading. K.E. Stanovich, R.F. West, A.E. Cunningham, J. Cipielewski, S. Siddiqui, The Role of Inadequate Print Exposure as a Determinant of Reading Comprehension Problems. T. Ruffman, Reassessing Children's Comprehension Monitoring Skills. Part II: J. Oakhill, N. Yuill, Higher Order Factors in Comprehension Disability: Processes and Remediation. S.E. Stothard, C. Hulme, A Comparison of Reading Comprehension and Decoding Difficulties in Children. C. Cornoldi, R. De Beni, F. Pazzaglia, Profiles of Reading Comprehension Difficulties: An Analysis of Single Cases. C.A. Perfetti, M.A. Marron, P.W. Foltz, Sources of Comprehension Failure: Theoretical Perspectives and Case Studies. Part III: K. Cain, Story Knowledge and Comprehension Skill. N. Yuill, A Funny Thing Happened on the Way to the Classroom: Jokes, Riddles and Metalinguistic Awareness in Understanding and Improving Poor Comprehension in Children. M-F. Ehrlich, Metacognitive Monitoring in the Processing of Anaphoric Devices in Skilled and Less-skilled Comprehenders. Part IV: M.A. Barnes, M. Dennis, Reading Comprehension Deficits Arise from Diverse Sources: Evidence From Readers With and Without Developmental Brain Pathology. M. Marschark, M. Harris, Success and Failure in Learning to Read: The Special Case (?) of Deaf Children. L. Lumbelli, Focusing on Text Comprehension as a Problem-Solving Task. A Fostering Project for Culturally Deprived Children. L. Baker, Social Influences on Metacognitive Development in Reading.